"Keep knocking and the joy inside will eventually open a window and look out"
Cynthia Moore has developed Core Integration from years of working creatively with clients’ psychological processes. 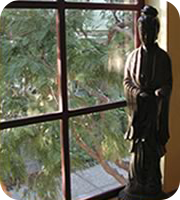 Core Integration blends Gestalt techniques with Buddhist meditation, shamanic practices and hypnosis to synthesize a powerful, transformational approach to healing. The goal of Core Integration is to shift the nucleus of our identity from the conditioned, False Self system to the healthy, authentic presence of our Core Self. How is this different from classical psychotherapy? Instead of relying on cognitive analysis of a client’s issues, Core Integration drives a little deeper. Beneath the cognitive awareness lies an experiential plane as rich and vast as any dream world. In this subjective domain, clients are able to access the wisdom and guidance of the Core Self. Through imagery and gentle visualization, clients cultivate inner acceptance, find solutions and reclaim their power and purpose in the world.